This gorgeous property is ideal for someone looking for a house AND a large open pavilion for your clients or entertaining guests. The property is located about eight minutes above Dominicalito, a very small town with one of the safest swimming beaches on the Costa Ballena. When you arrive at the property, you pass through the gate and proceed up the concrete strips leading to the house and parking area. The 1,100 sq. ft. house features a 2-bed/2-bath design with a small living room and kitchen area. The colorful paint and tile work adds to the colorful jungle that surrounds the house. Just outside the main living area you will find the l-shaped patio with plenty of room for a dining table, a couch, and a hammock. A few more steps down you will find the swimming pool wrapped with a sundeck. The thick canopy of trees and foliage only offer peaks of the blue Pacific Ocean, but the ocean view opens up dramatically from the pavilion. What exactly is a pavilion you ask? This 1,000 sq. ft. structure was originally built and used as a cinema in the jungle. In addition, the owners held a variety of private parties and events in this refined and breezy space, complete with Spanish tile and natural wood banisters. In addition to the ocean and mountain views, the pavilion also has an office, a bathroom, a kitchenette/changing room, and outdoor sitting area. This property is ideal for anyone who wants to host large groups, run a business that requires room to move, or just wants extra covered space for themselves. The property has good infrastructure, and water is sourced from a private well. 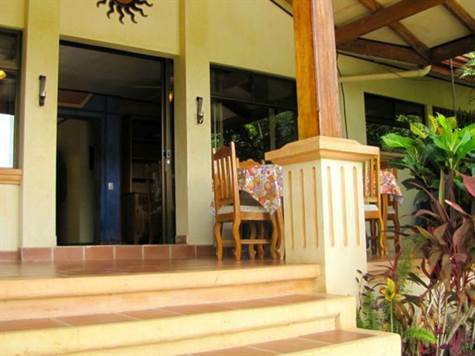 For a first step investing in Costa Rica real estate, this is an entrepreneur's dream in the hills of Dominicalito.